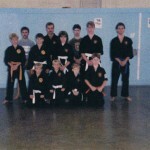 As a blue belt, with my class at the Ford Island Gym. Gymnasium (now the Pacific Aviation Museum) in hangar #37. 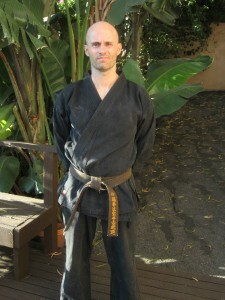 I achieved 2nd Dan black belt rank before relocating back to California. Karate, as practiced in Hawaii, is a very traditional martial art that originated in Okinawa. In fact, Hawaii was one of the first places outside of Okinawa and Japan that karate was demonstrated to the public in the early 1900s. Okinawan Kenpo was founded by Shigeru Nakamura in the 1950s. It was originally intended to be a way of encompassing all styles of Okinawa Karate into one, as Nakamura Sensei didn’t like the separation of the various styles that were always competing against each other. His intention was to foster mutual cooperation. Nakamura died in 1969 and named Seikichi Odo as his successor to the style. 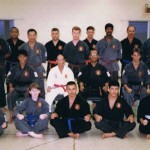 Hawaii Okinawa Kenpo Karate-do Shudokan with Grandmaster Odo in White, and Sensei Bunch seated to his left. I am seated next to Sensei Bunch. Odo Sensei served as Grandmaster till his death in 2002. 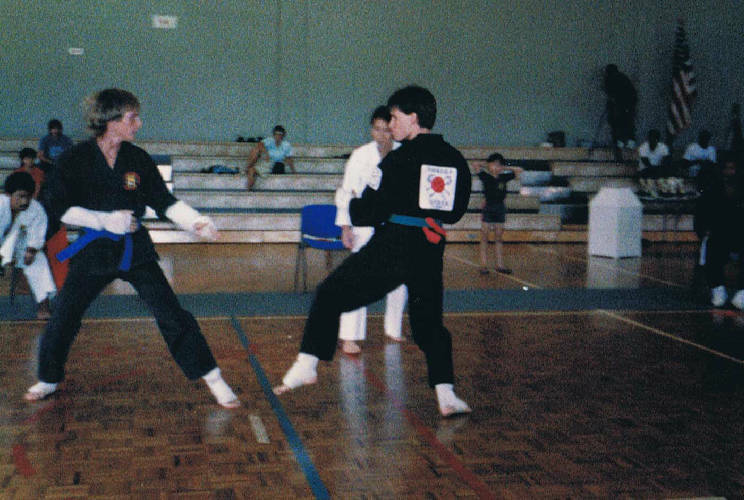 He originally founded the Okinawa Kenpo Kartate Kobudo Federation, adding the weapons art to the style. 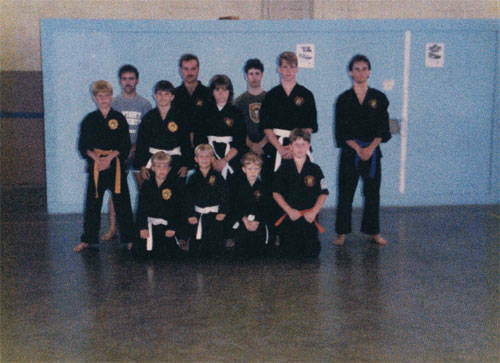 To this day, Okinawa Kenpo practitioners learn weapons at the color belt level, unlike the few styles that incorporate weapons training at black belt level. 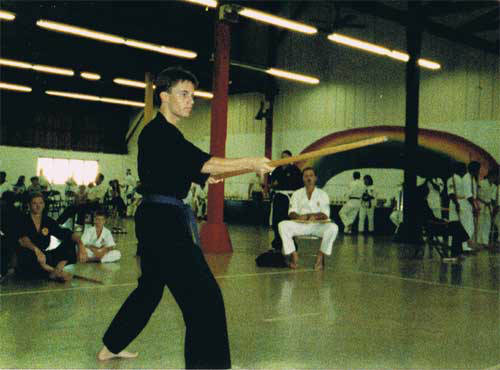 Kobudo and Karate are inexorably linked to Okinawan culture, and you cannot effectively study either without learning a basic understanding of the island culture they came from. Though originating in China, these martial arts have a distinctively Okinawan flavor to them. The various schools of karate in Hawaii enjoy a friendly collaboration with each other. 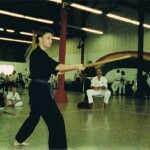 Performing bo staff kata “Shima Igiribo Ichiban” in a Hawaii tournament. Weapons training began at purple belt. Unlike a lot of school rivalries on the mainland, Hawaii’s traditional martial arts community is very supportive of each other and frequently exchange ideas and train together. I often would be fortunate to have visiting sensei from other Hawaii dojo teach us things from Kyokushin, Goju-Ryu, Shotokan, and Shorin Ryu. The primary outlet for all this training was tournament competition. Our dojo competed a lot, and also hosted many tournaments. As a result, a great chunk of my training was competition based. Kata, Kobudo, and point fighting are the three main components to the traditional karate tournament. 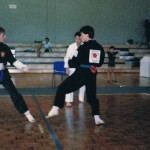 Point fighting in a Hawaii Tournament as a green belt. Over the years, before his passing in 2010, Sensei Bunch developed HOKK into a competitive force that entered into WKF competition, and many of my fellow black belts have gone on to successful tournament careers and are now training the next generation of karateka. 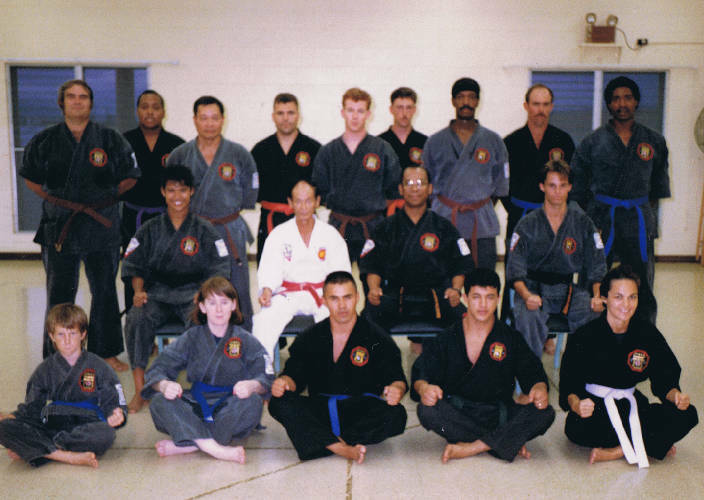 Training at the Moanalua Dojo, Hawaii. 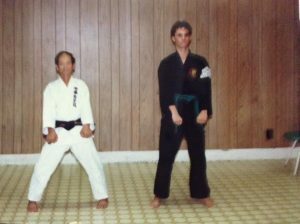 As a green belt with Grandmaster Odo during one of his many visits to Hawaii. 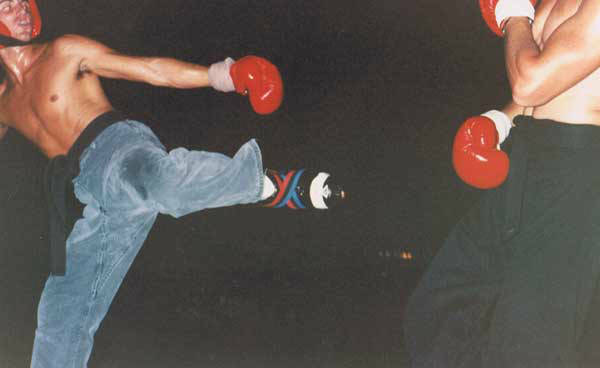 While in Hawaii, I began training in full-contact kickboxing, though not with any formal instruction. Instead, I found willing sparring partners and put the gear on to go at it. I quickly learned what worked and what didn’t in a full contact environment. As a consequence, I abandoned point fighting altogether. 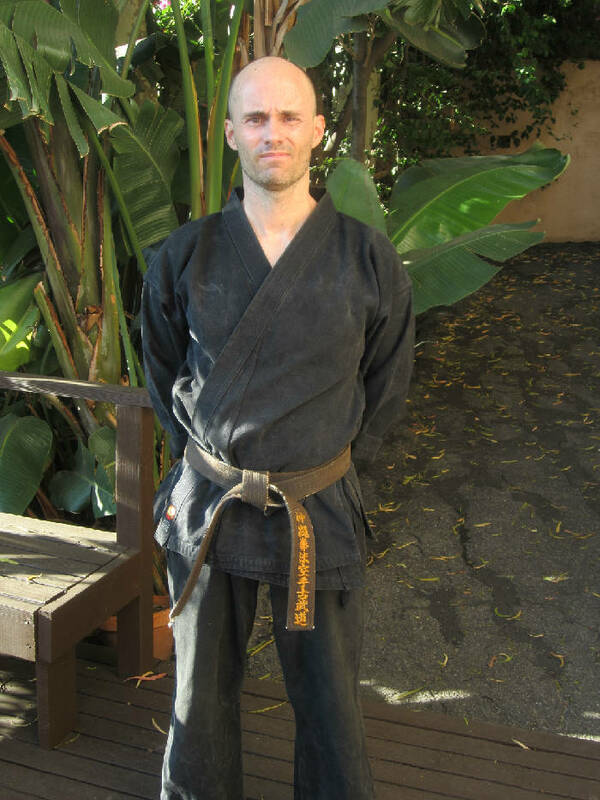 After relocating back to San Diego, I also cross trained in Chinese Kempo, not achieving any rank, but using it to broaden my skillset. 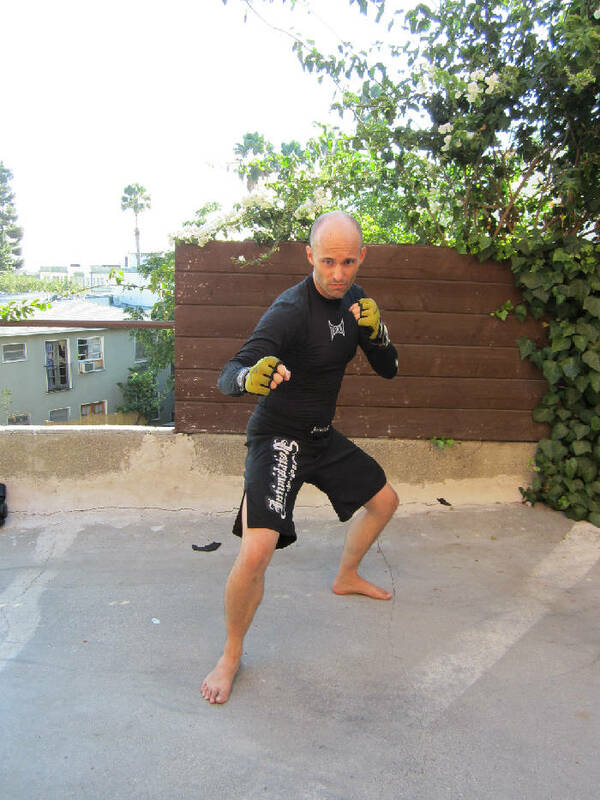 Once I moved up to Los Angeles, I also cross trained in other karate and kung fu styles, mainly to perform in various film and television projects. 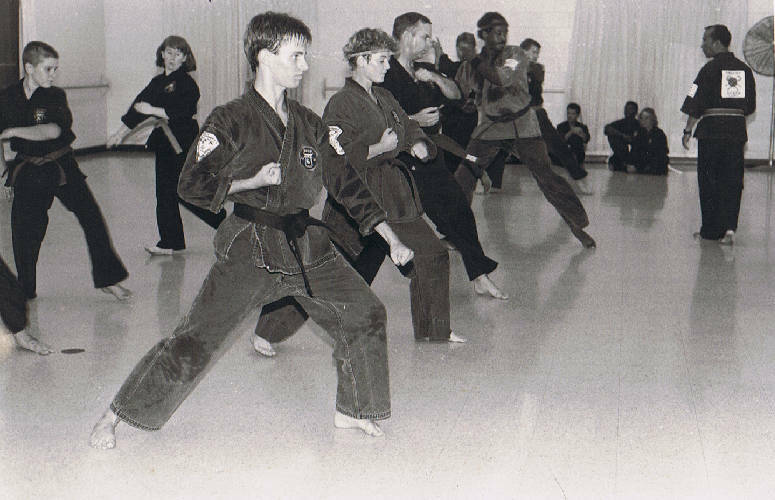 One of the other styles I trained in was Shotokan karate. I taught that style for a couple of years, but always maintained my Okinawan Kenpo. One of the things I most enjoy about Okinawan Kenpo is the inclusion of Kobudo, or weapons training. Throughout my journey, I have been exposed to many different arts and systems and am always excited to learn something brand new. The arts are not only a method of self defense, but of personal development and fitness (if practiced properly). 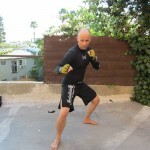 Geared up for MMA in Hollywood. The relatively new phenomenon of MMA is exciting and fun to explore as well. 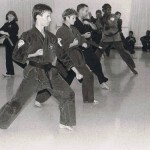 I have been training for the majority of my life and look to the martial arts as a lifelong endeavor. I expect to be punching and kicking well into old age. Training is my passion, and so is teaching and passing on what I have learned to the next generation. 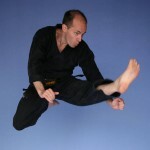 I’ve included some of my tutorial and kata videos in this section of my website. Hopefully you will find them useful, and will get some insight into my own personal expression of karate and martial arts.